Custom-made mag pouches by KYTEX® Shooting Gear for CZ 97B .45 double-stack full size magazines. 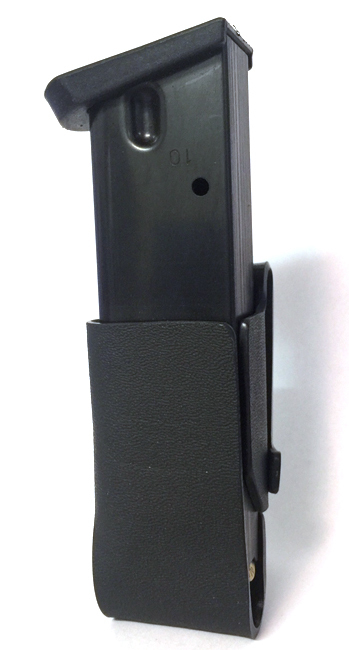 Self-tensioning design made of firearms-grade Kydex® eliminates need to tighten screws to adjust. Smooth, quick reloads from simple, one piece design. Lightest weight and smallest width possible, allowing up to six mag pouches to fit on one belt in USPSA or IDPA competition in Production or Stock Service Pistol. Impervious to all firearms cleaning chemicals and oils. Can be removed from belt quickly when needed. Fits up to 1.75" belts.